So, I hadn't realized this was re-released. I first started following Kazu Kibuishi online years ago, before Amulet was a thing, by reading his Copper comics. (I've got those in printed form too, now, so that will be reviewed here at some point.) But by the time I realized I was in love with his style and his sensibilities, his first graphic novel, Daisy Kutter, was no longer in print and unavailable anywhere. I was always sad about that because it looked fantastic. Well, it is. One of my local comic stores supported Kibuishi's Kickstarter to reprint Daisy and I got their last signed copy, which you can imagine made me feel like queen for a day. 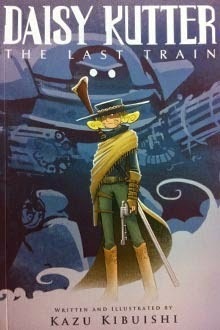 It's a steampunk western. Daisy is an ex-con who owns and runs a general store. It's pretty clear she's bored out of her skull by it, but it's a legit living. Her excitement comes from playing poker. So when she loses the store in a high-stakes poker match, she has no choice but to take up the winner's offer to give her the store back - if she participates in one last heist. There are a few plot holes and the ending wraps up incredibly quickly, but this is the first in (I hope!) a series, and it was extremely enjoyable. Daisy's got depth, as does Tom McKay, the local sherrif who also happens to be Daisy's ex-partner in crime, and ex-partner, period. There are lots of questions to be answered, lots of fleshing out to happen with both characters. The world, while somewhat sketched-in for this first instalment, has a huge amount of promise. Very much looking forward to the next book. I find it hard to write about this one because all I want to say is LURRRRVE. This is a sweet, funny, quirky, sensitive, wonderfully-drawn coming-of-age graphic novel about a girl who is starting high school after being homeschooled her whole life. She has three older brothers whom she adores, and hasn't really ever felt the need for any friends outside of them. But they've all got their own lives and challenges at school, so she's kind of on her own. Lucky for her, she's not the only one in need of a friend. What's nice about this is that it's not really deep or difficult, but it's still a portrait of a kid trying to find her place and fit in, while dealing with stuff - some mundane stuff, like dealing her mother's decision to leave the family or her first year at school, and some not at all mundane stuff, like the strange ghost who keeps following her around. Maggie's got challenges but she's competent, and her family (with the notable absence of her mother) is loving and supportive. This makes the book feel safe and a bit gentle, which is sometimes a nice thing in a coming-of-age book about outsiders. This book is also really funny. The art supports the characters' development in the best way possible. Hicks can express a huge amount about a character just with facial expression and small gestures, and she uses that to full effect. 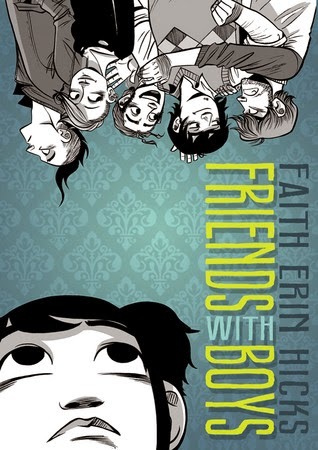 It's an easy-to-follow style, too, meaning this is a great entree into the world of graphic novels. Excellent amounts of geek humour and an affirming message that being "weird" - however one defines it - is okay. I'm not sure I really need to introduce this book. 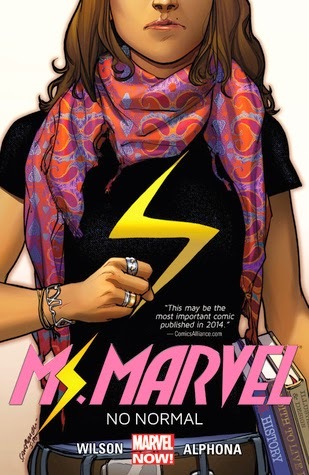 It's gotten a lot of attention because Ms. Marvel is Kamala, an American-born Muslim teenager of Pakistani decent, who in addition to having to deal with the sudden onset of superpowers and the appearance of a supervillain, has to deal with obnoxious, racist classmates, a fairly traditional family, a diet that forbids bacon, and a curfew. It could have smacked of diversity lip-service, but it was so well-written it didn't. The book lives up to the hype. There are a lot of things to like here, from the fast-paced plot and the bright, stylized art, to the way it handles what shouldn't be a sensitive issue (Kamala's race and religion) but really is. But what I really appreciated was how realistic the whole thing feels from an emotional perspective, which is not something one can always say when reading superhero comics (or fantasy novels, for that matter.) While the title of the volume is "No Normal" what is refreshing is just how normal Kamala is, right down to the fights she has with her parents when she breaks curfew and is then punished for it. She's got superpowers and she handles their onset in a believable way. She's a teenager and she feels like a teenager. Also, on a very frivolous note, I dare you to read this one and not fall a little in love with Boris. Just be warned - I'm not sure it quite lives up to its premise, but there's so much potential I could forgive it. I hope you can find a copy! They are still around, as far as I can tell.